Pennsylvania State University-Penn State Abington received a B.
Washington Monthly's ranking of 227 out of 246 of Liberal Arts Colleges - Overall Rank was a major contributor to this grade. "Penn State Abington College in University Park (near Philadelphia) offers two-year studies geared toward building the groundwork for Penn State degree, as well as several professional and four year programs. Abington schedules a daily "Common Break," when no classes are scheduled." What is a typical Pennsylvania State University-Penn State Abington student like? Describe the type of person that should attend Pennsylvania State University-Penn State Abington. What are the top 3 reasons someone should attend Pennsylvania State University-Penn State Abington? What was a typical Pennsylvania State University-Penn State Abington student like in high school? Describe the type of person that should attend Pennsylvania State University-Penn State Abington. What are the top 3 things that students do for fun at Pennsylvania State University-Penn State Abington? The average student pays $12,123 for tuition, fees, and other expenses, after grants and scholarships. Total stated tuition is $12,706, in-state and on-campus, before financial aid. Pennsylvania State University-Penn State Abington participates in the for college athletics. 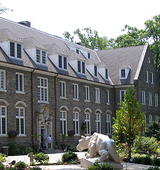 Want more info about Pennsylvania State University-Penn State Abington? Get free advice from education experts and Noodle community members.